WILLEMSTAD - In Curaçao, a new government under the leadership of Eugene Rhuggenaath was sworn in this morning. This ended a period of more than two months, in which an interim government led by the MFK of Gerrit Schotte was in power. The new government took office one month after the last elections and wants to instantly work on a social plan to combat poverty. In addition, the coalition under the leadership of Rhuggenaath has undertaken to work hard for more financial reliability. Curacao experienced a lot of political unrest with two elections in a short period of time and political quarrels over the past period. 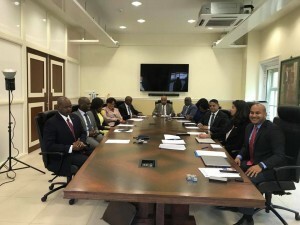 The MFK of Schotte tried to stop new elections, but the government in The Hague placed the island under higher supervision and the Governor of Curaçao was in charge of the elections. The PAR under the leadership of Rhuggenaath won the elections in Curaçao at the end of April. The yellow party took six seats in parliament, MAN five and PIN one. Together, the parties have twelve seats of the total of 21 seats in Parliament. The MFK scored five and is now the biggest party in the opposition.